Level 1 - Four Day CourseLymphatic Therapy Training Course covers lymphatic congestion in the following areas: transverse and descending colon, ribs, head and neck, chest, back, axilla and breast. Advance registration and a non-refundable deposit is suggested for all lymphatic classes. A discount is applied if registered 2 months before class date. If a lymphatic class is cancelled due to attendance requirements, deposit is applied to future classes. Call early as seats are very limited. Call Alt Med Services at 605.343.2682 to register. After years of extensive research, Dr. Cory Carter de veloped a simple, but effective, way to move the lymph. This technique couples the sophisticated technology of the Lymphstar Pro® with manual therapy to provide measurable results. 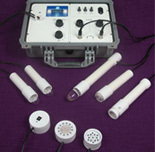 The Carter Technique for Lymphatic Drainage is taught in three separate levels, each course lasting four days. All earn CEU credites from the AMTA or credit hours from the International Academy of Naturopathy. Courses are taught by professional lymphatic therapists in private practice. Level 1Lymphatic Therapy Training Course covers lymphatic congestion in the following areas: transverse and descending colon, ribs, head and neck, chest, back, axilla and breast. Training is four days. Level 2 Lymphatic Therapy Training Course covers lymhatic congestion in the following areas: entire colon, arms, legs and scars. Also covered is advanced breast work, the immune system, CEDS and lymph, and scar release. Level 1 is required. Training is four days. Level 3 Lymphatic Therapy Training Course is currently under revision. Many factors affecting the lymph (Lyme disease...) has made it necessary to explore even deeper into the movement of lymph through soft tissue and the best way to get the body to respond to treatment in the soft tissue areas. Alt Med Services has successfully used CEDS with clients from all over the United States. 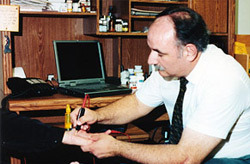 In the effort to help all those looking for a safe, natural, and effective way to keep or regain health we train health practitioners in the use of computerized electro dermal screening. If you are interested in becoming a health practioner or want a more accurate way to determine your client's needs please call Cory Carter at Alt Med Services - 605.343.2682. Session #1 is the first 4 days of a 16 day course. There will be 3-4 sessions lasting 4-6 days at a time for a total of 16 days of training. Each new session date will be determined by the class as a whole so bring your schedule. Class begins at 8:30 am and runs until 5:30 pm each day in our teaching room at Alt Med Services. If you have already taken the class and you want to attend a refresher, you may make a donation. Feel free to pass this information on to anyone interested in training. 605.343.2682. 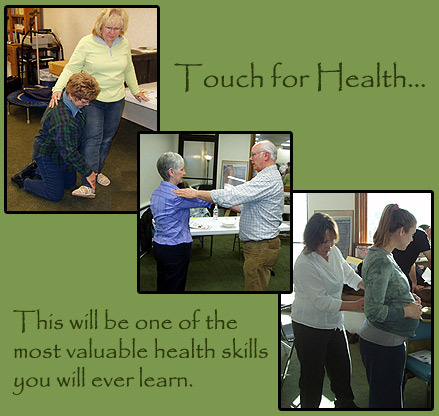 Touch for Health is the best of old-age science (acupressure) and modern principles of physiology put together in a set of techniques that will revolutionize the way you take care of your body. This is one of the most valuable health skills you will ever learn. If you are interested in attending a class and the dates above have past or do not work please call and we will put you on a calling list - we will schedule additional classes each time we have at least 10 students.